This is a picture of the commencement ceremony at Oregon State University, (OSU) which took place in the summer of 2016 and involved more than 6,400 students from 63 counties. In many respects it was similar to ceremonies taking place across US campuses last summer as it also included thousands of students with their families and friends celebrating their achievements. 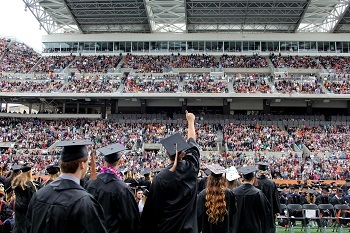 What made this one a little different is the fact that amongst those graduating were 230 students whose journey had begun on Pathway programs at OSU. These were students for whom, seven years ago, the prospect of an education at a great American university would have been a distant dream. OSU would have been unable to reach those students, or to offer them the support they needed in order to thrive. Hasan is from Syria – a country beset by tragedy and often synonymous with desperate people going to extreme lengths to escape conflict and forge a better life for themselves. Hasan’s achievements represent much more than one student attaining his goal. Hasan’s presence has enriched the OSU campus, brought a wider understanding of the world to his classmates and reaffirmed the fundamental power of education to change lives. It is why we believe so passionately in connecting global students with great universities. The power of education to change lives at the heart of our mission and Hasan’s story is a powerful testament to the value international students bring to our campuses across the United States.